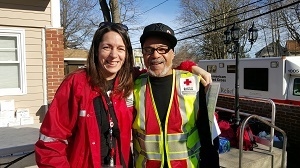 Lori-Ann (left) with fellow Red Crosser Mike DeLeon. Lori is an elementary school art teacher and a volunteer with the American Red Cross on Long Island. She has worked as a teacher for 11 years in the Syosset Central School District. At the Red Cross, Lori is the lead volunteer for the Long Island Home Fire Campaign, and also serves as a volunteer with the #GetAlarmedNYC program, as a presenter with The Pillowcase Project, as a Disaster Action Team (DAT) responder, and as a photographer at events. She is also certified to drive an Emergency Response Vehicle (ERV)! A: I always had a passion for art, my undergraduate degree was interior design, but I felt something was missing. My best friend told me I would be great working with children, so, with a toddler at home, I went back for my Masters in Art Education. My life has changed so much as a teacher. It is so rewarding! A: Making a connection with a student and changing their perspective, makes them see things in a different way. I love it when a student says “look what I did!” :) Its making a difference that is so rewarding. A: My brother (Joe Spaccarelli) quit his job after 27 years to work with Red Cross. I wanted to help him with his mission. I saw his passion and jumped right in! A: Both care so much about helping others and give selflessly. Both also take the time to learn their role and do it efficiently. I am taking classes with Red Cross all the time. You never stop learning. I enjoyed my experience with the Red Cross so much, I recruited three teachers at my school to become Red Cross volunteers, too! We always just want to help.